The Deep State is once again set to spoil President Trump’s historic foreign summit with North Korean tyrant Kim Jong-un. Dirty cop Robert Mueller indicted 12 more Russians in July in his ongoing witch hunt to discredit and bring down the Trump administration in a phony collusion scandal. Mueller and accomplice Rosenstein waited to announce the junk charges until the US president was on foreign soil and just days before his meeting with Russian President Vlad Putin. To date 80% of Robert Mueller’s junk indictments have been against Russians who will never face a US court because they will never visit the United States. And then there is this… As Gateway Pundit reported earlier – ALL of the new and urgent information released by dirty cop Rod Rosenstein in July was already published months ago in the House Intel report on Russian active measures released by Rep. Devin Nunes. Rep. Devin Nunes (R-CA) tweeted this out in July. 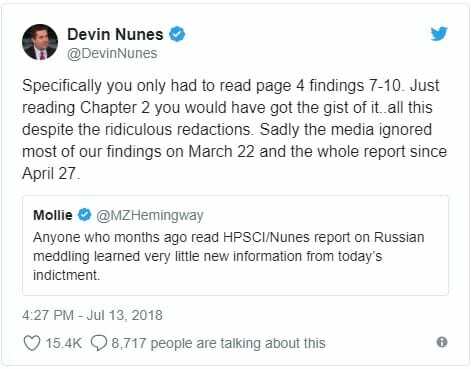 Devin Nunes tweeted out in July that his House Intel panel report on Russian active measures uncovered everything in the latest Mueller Russia indictments. It is all listed on the Summary of Findings in the April House Intelligence Report. Rosenstein and Mueller did this on the last business day before the Trump-Putin meeting in Helsinki. Then in December—- Canadian authorities arrested the chief financial officer of Huawei at the request of the United States. Meng Wanzhou is the CfO of Chinese telecommunications giant Huawei, the largest communications company in the world. The US Department of Justice had Wangzhou arrested while President Trump and his top administration officials were meeting with Chinese officials after the G-20 meetings in Buenos Aires. Peter Navarro, assistant to the president on trade policy, spoke with Trish Regan on her new show Primetime. The DOJ arrested the Chinese business leader knowing it could disrupt President Trump’s trade talks. On Wednesday and Thursday of this week President Trump will meet with North Korean dictator Kim Jong-un. To counter this historic meeting House Democrats called in President Trump’s former attorney Michael Cohen to testify against President Trump. Democrats need the Trump-hating headlines. Michael Cohen is going to prison in May for lying to Congress. But that doesn’t matter the House Democrats will have him testify this week against the president anyway. SIGN THE PETITION: End The Robert Mueller “Witch Hunt” For Good! The president’s former personal attorney will appear on Congress on Tuesday for a closed-door hearing before the Senate Intelligence Committee. During Cohen’s public hearing on Wednesday, however, multiple reports suggest that Cohen plans to come forward with evidence and everything he knows about Trump’s business interests in Russia and his illegal hush money payments ahead of the 2016 election. According to NBC News, Cohen is expected to provide evidence of alleged criminal conduct by Trump since he became president, though this appears to come from a single source and no further detail is reported.